Sooji ki kheer or also known as semolina kheer may not be as popular as sooji ka halwa or a rice kheer but I can assure you it is an easy dessert recipe with it's simple way of cooking and yet an extraordinary taste. 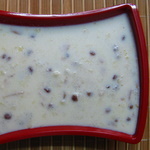 Somelina kheer is very popular amongst the Parsi community in India. They make this dessert on many special occasions such as birthdays and anniversaries. Please do not confuse chironji with kalonji. The latter is called nigella seeds and is used in savory cooking rather than desserts. Chironji is used in many Indian desserts. It is also known as cudpahnut. Here is a picture of chironji. Bring milk to a boil and then simmer till it is reduced to half the quantity. Keep stirring in between to avoid the milk from burning at the bottom. Blanch, peel and slice the almonds. In a separate pan, melt the desi ghee and slightly fry the almonds till light brown. Take them out. Next, fry the chironji and raisins. When the raisins get puffed up, immediately take them out. In the left over ghee roast the suji on a low flame as the suji tends to get burned quickly. Keep stirring the suji constantly and when it starts changing color to light pink and a nice aroma comes out, switch off the gas. Add the suji in the reduced milk and keep stirring on a low flame. Also, add sugar and the dry fruits and nuts. Cook till little thick but still dropping consistency. It will thicken as it cools. Lastly add vanilla essence, nutmeg, cardamom and rose water. Allow to cool to room temperature and then refrigerate. Serve chill and enjoy the sooji ki kheer!